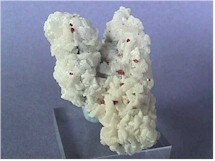 Blood red, small cinnabar crystals on snow white dolomite. A couple larger crystals on the back side and one on the top. 6-1/4cm (2-1/2") tall. 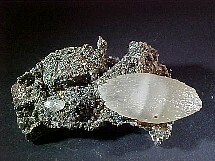 Calcite on a sparkling pyrite matrix. A kind of neat miniature from the La Sirena Mine. The main crystal is 1-1/4" across. The matrix is 2-1/3" across. 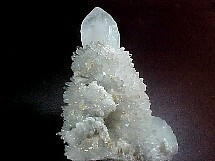 Quartz-Feldspar, var. Adularia : Guanajuato, Mexico. A very striking display piece from the Valenciana Mine. 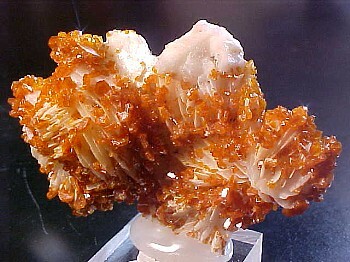 1-3/4" across the base x a little over 2-1/2" tall. .
A very striking miniature of orange-brownish vanadinite crystals with barite. This sparkling miniature is mounted and ready for show. 2" across. 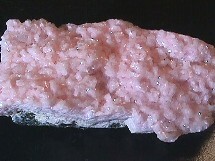 Pink rhodochrosite crystals on a pyrite, sphalerite matrix from the Boldut Mine. 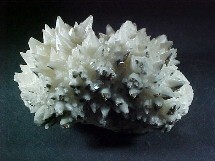 A small cabinet piece, 6-1/4cm (2-1/2") across. Lovely snow white calcite with sparkling pyrite adds a very nice touch to this miniature. The pyrite shows much nicer in the larger image. 2-1/4" x 1-1/2"